In your experience as a working professional, you might find yourself working at home in the evening to keep up to date with what is new and happening within your industry. What might be most important for you is a space at home where you can feel inspired to do your best work. The Lori Collection offers a home office solution for working professionals that gives us this and so much more. 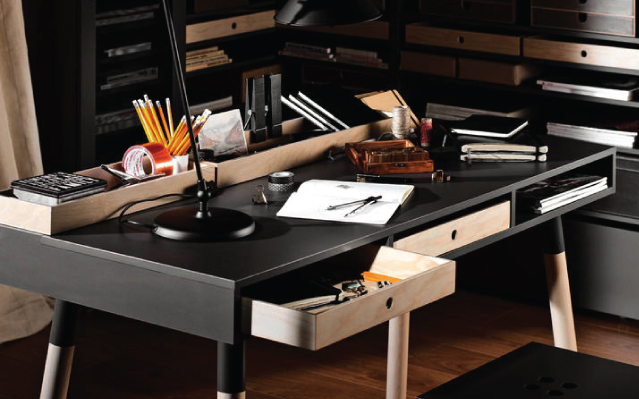 For home offices, a desk that functions well is essential. Let’s have a closer look at how the Lori Desk will make working at home a breeze and make you feel inspired to do so much more. Firstly let’s look at the design of the desk. With a beautiful unique graphite finish and slanted oak legs with a roomy desktop, the Lori Desk is as striking as it is functional. For easy access, there are three cubbies below the desktop. Add the loose Acacia Drawers to turn them into sliding drawers. Furthermore, the desktop has a clever recess top back. Here the Lori Acacia storage boxes have been designed to fit perfectly. Keeping your desktop organised is now a breeze. The recess also allows for neat storage of pens, rulers, computer and lamp cables. Lori offers a selection of beautiful bookcases made in the signature graphite finish Lori prides itself on. When you combine the Wide, Narrow and Triangular Bookcase, it makes for an impressive wall unit that even curves at the end with the clever triangular corner unit. The shelves on the bookcases are adjustable, so you can store things easily here. 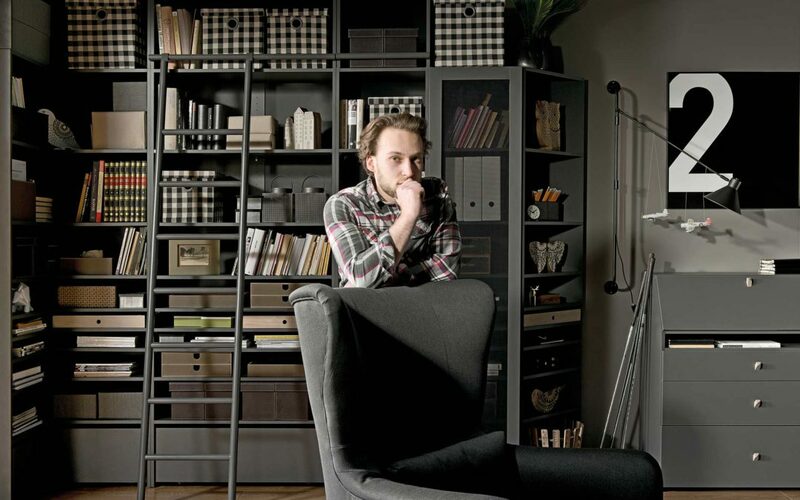 Furthermore, drawers can be added that have been designed for each bookcase respectively. The Acacia Drawers add an elegant look to your space. Here the small things that you treasure can be stored neatly. The Lori Wide Chest can be added to expand even further on office storage – this fits perfectly into the Lori Wide Bookcase. 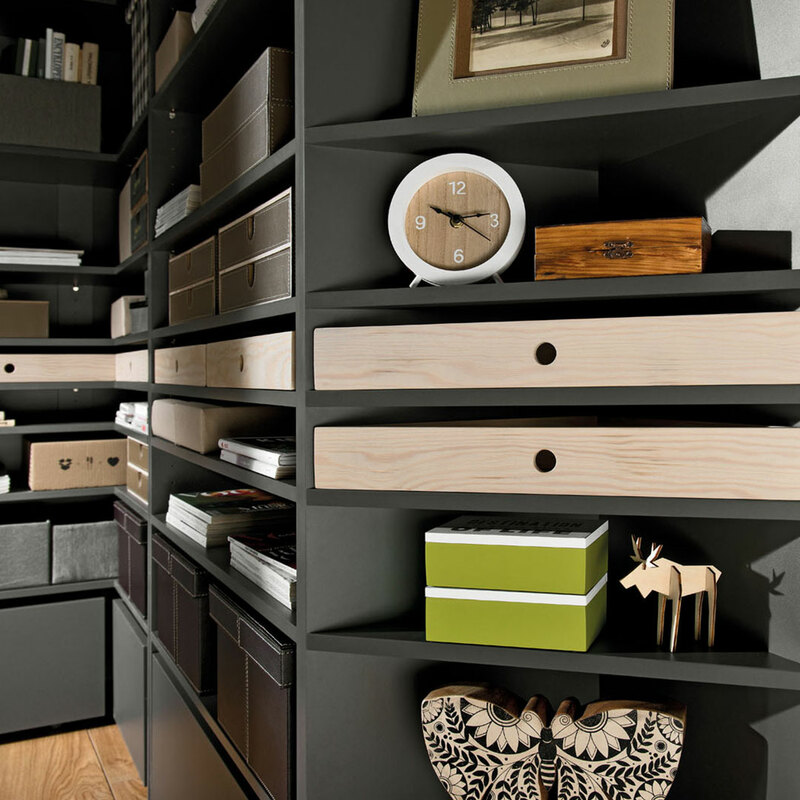 Designed to suit differently sized rooms, the unique Harmonica Bookcase can be contracted and expanded to the size that your space requires. With this, as the bookcase expands it provides shelving and storage space for all of your favourite literary works. Not only is the Harmonica Bookcase a practical piece, it is beautiful as well. The laminated board of the three components in trendy hues (Graphite, Oak Grey, and Cashmere) is both durable and easy to clean. This gives a sophisticated look to your space. Watch below the capabilities of this ingenious piece of furniture. What is the one thing you can’t go without when working from home? Share with us in the comments below. Be sure to like us on Facebook and sign up to our newsletter to be the first to know about special offers and blog posts as they go live. To get inspired, follow us on Instagram @Voxfurnituresa.